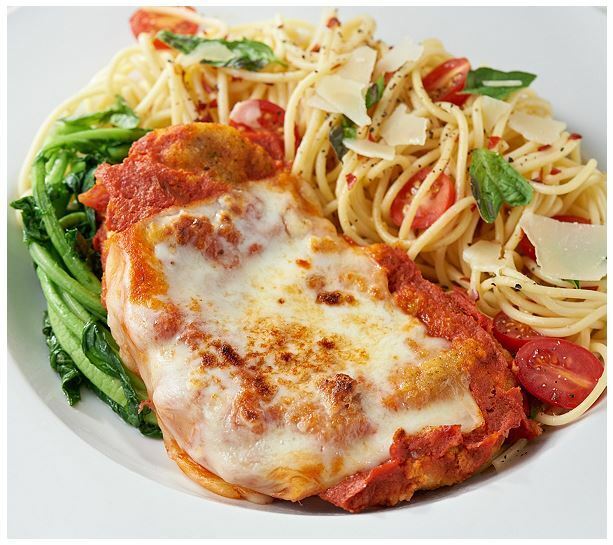 The Chicken Parmesan from Heartland Fresh is an easy-to-serve Italian classic. We use whole chicken breasts and cover them with delicious lemon Parmesan bread crumbs, top with a tangy marinara, and real mozzarella cheese for an amazing meal in minutes. COOK FROM FROZEN. Preheat oven to 375°F. Open individually wrapped chicken using the easy open corner tab. Spray a foil lined sheet pan with non-stick cooking spray. Place frozen chicken on pan, chicken side down; sauce and cheese side up. Remove from oven and let rest for 2 minutes. Serve.